Click on 'Collections' in the main menu. Bring your mouse over the '-' icon enclosed in a black circle and you'll see the message: "Do you want to hide list "$1" by $2? ", where $1 and $2 are supposed to be some texts. Also notice the positioning of the icon. It's well outside the container. It should not be pushed that far to the right. It should align with the right of the collection list. bmansurov raised the priority of this task from to Needs Triage. 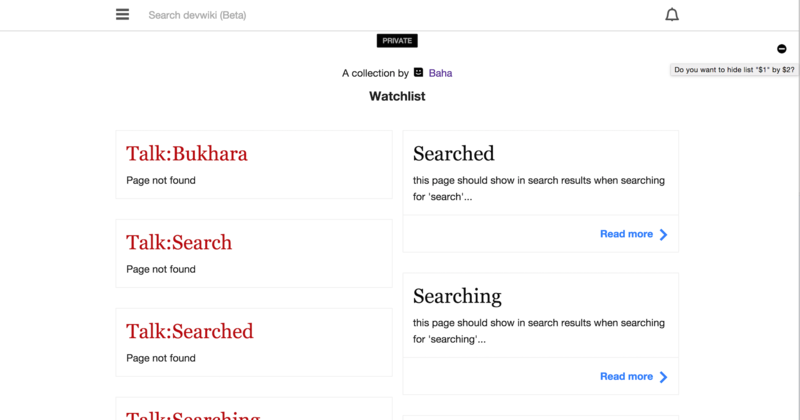 bmansurov added a project: Readers-Web-Backlog. bmansurov added a subscriber: bmansurov. @bmansurov: Is this about the Gather code project? If so please add it so people can find this bug when looking for bugs in Gather. bmansurov set Security to None. KLans_WMF moved this task from Needs Analysis to To Do on the Reading-Web-Sprint-50-The-X-Files board. The flag should not be showing on the watchlist. Oh wait.. this is the hide button, you can only see this if an admin.